Here is the list of Best Free Christmas Card Maker Software, which you can use to make attractive and Personalized Christmas Cards. Christmas season is around, and you must be looking for Christmas Card maker software to make personalized Christmas cards for your loved ones. This list will help you out with software to let you make Christmas greeting cards, absolutely for free. Yes, you must be having a hard time finding FREE Christmas card software, and the following list contains software, which are absolutely free to use, without any hidden charges. These software provide Christmas card templates to choose from, which can be customized easily by adding Photos, Text, Stickers, etc. You can even add custom background images here to create wonderful Christmas greeting cards. Add Photos from your computer, resize them, rotate them, and place on your card. Add Text in different colors, fonts, and sizes. Not all, but some also let you add Clipart and stickers in different sizes. Directly print your image from these photo Christmas Card maker software, or save as images in JPEG, PNG, or BMP formats. All of the listed software can not only make Christmas Cards, but can be used to make various other Greeting cards. These Greeting card makers have various templates which you can use to make cards for Anniversary, Holidays, Travel, Birthday, and much more. 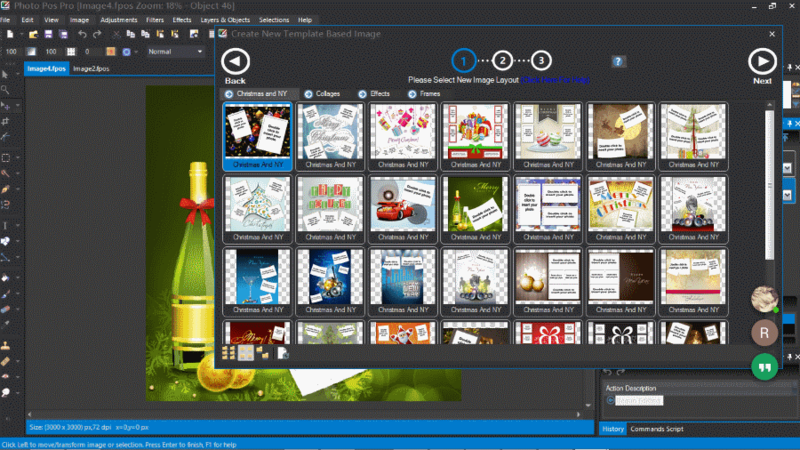 Go through this list of best free Christmas Card Maker Software to know more about them; you will also get to know How to make Christmas Card using these software. You can also checkout the list of best free software To Add Text To Pictures, Image Editors, and Best Websites To Download Free Stock Photos. Photo Card Maker is an excellent and simple Christmas card maker, where you can make personalized Christmas cards by adding templates, photos, and text. It is a greeting card maker and has various template sections to select and create photo Christmas greeting cards and other cards, such as: seasonal, holidays, cartoon, travel, sports, etc. You can even download more Christmas card templates from its website along with other greeting templates. Personalize your Christmas card by adding photos and text to a template. Load a photo, resize it, then place it anywhere on the card. Add text in various fonts, colors, and sizes. Drag your text, edit already added text, and save as a template. Once you make your card using this Christmas card maker, save it as JPEG, PNG, or BMP. Photo Pos Pro is a free image editor software, with an extensive list of tool sets. You can use it to make Christmas greeting cards on your computer very easily. It provides downloadable templates, which you can customize to add your own text and photos. In addition, you can also add various festive objects to your greeting cards. There’s much more you can do to make attractive Christmas cards and other greeting cards. It is primarily an image editor, but I am not going to focus on its image editing capabilities, rather I will talk about the process to make Christmas greeting cards. The Christmas templates are not pre-loaded, and you have to download Christmas – New Year template pack from the software’s website; there are various other plugins available and you will find some tools and other greeting templates on the plug-in page. 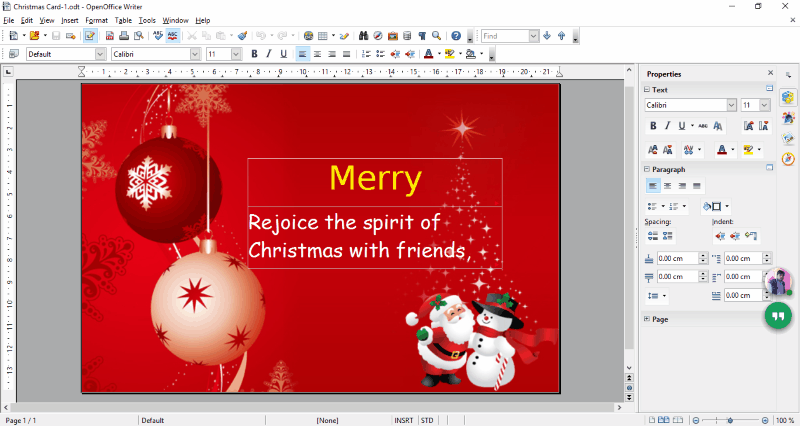 The Christmas card template downloads as an executable file; install it to use the templates. After installing the template pack, Open Photo Pos Pro, then go to File>New>Christmas and NY. A new window opens Christmas templates, frames, and collage frames. 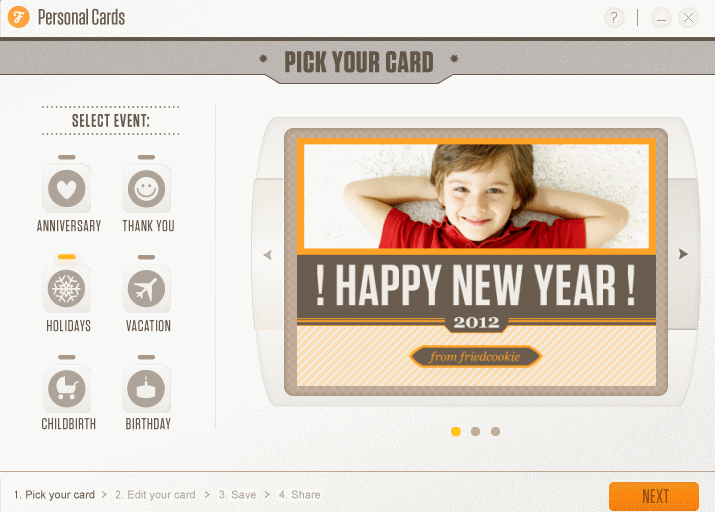 Select a template and set template dimension to start working with your Christmas greeting card for customization. Double click on the empty photo space to add a photo to the card. Resize the added picture, rotate it, then move and place anywhere you want. Add text or other shapes from the toolbar if you want, and save your card to send or print. Its a very remarkable photo editor and can be used as Christmas card maker or any sort of Greeting card maker. Personal Cards is a free personalized Christmas card maker software, where you can add your own text and photo. Along with Christmas greeting cards, you can make various other greeting cards here. You just have to select a card template, add a photo, and change text if you want. Begin with selecting an event, then select a card template. To make Christmas card, go to Holidays event, then select the Christmas template. To add a photo, drag and drop it on the card. Change the Merry Christmas title if you want, as the theme is Christmas based. You cannot add more text here. If you want, you can add more text to greeting card after saving it as a picture; for this, use any software to add text to photo. Your card can be saved in JPEG format on your computer. This greeting card maker is a simple one; however, it can be used for various occasions to make e-greeting cards. Other templates available on this Christmas card maker are: Anniversary, Thankyou, Holidays, Vacation, Child birth, and Birthday. It has limited number of templates, so don’t get your hopes high on this one. There are many free MS Word Christmas Card Templates available, which you can use to make custom Christmas greeting cards. These Christmas card templates can be downloaded for free and used with Word processor software, such as MS Word, OpenOffice Writer, or LibreOffice Writer. Word processors allow you to customize greeting cards by adding pictures, text in various fonts and style, and clip arts. The objects you add can be resized, rotated and placed anywhere on the card. After customizing card, you can save documents as Word documents or PDF. Easy print option is also available, so you do not have to worry about saving a Christmas card as image. Various websites offer free, copyright free Christmas Card templates. You can get few on this website, visit stock photo websites, or simply search google for more options.